Wow – it’s been way too long since I’ve written! And what’s prompted me now is that I can’t wait to show you my newest pattern, which is my exciting new Block of the Month quilt. This is my 2nd collaboration with Hoffman California Fabrics and I couldn’t be happier with the results! I’ve called it Nature’s Jewels because I used the rich, fully saturated jewel tones found in an autumn woodland. 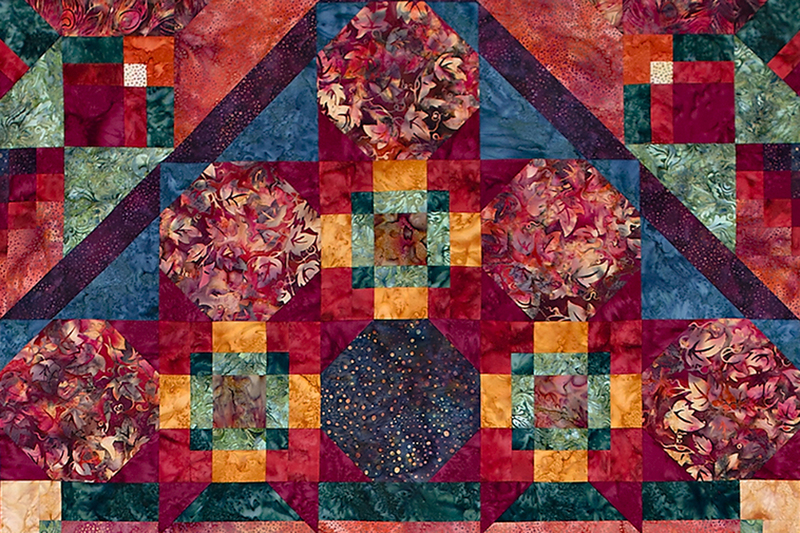 Many elements of the design resemble stars and crowns filled with faceted jewels, and are repeated throughout the quilt to further enforce the theme. 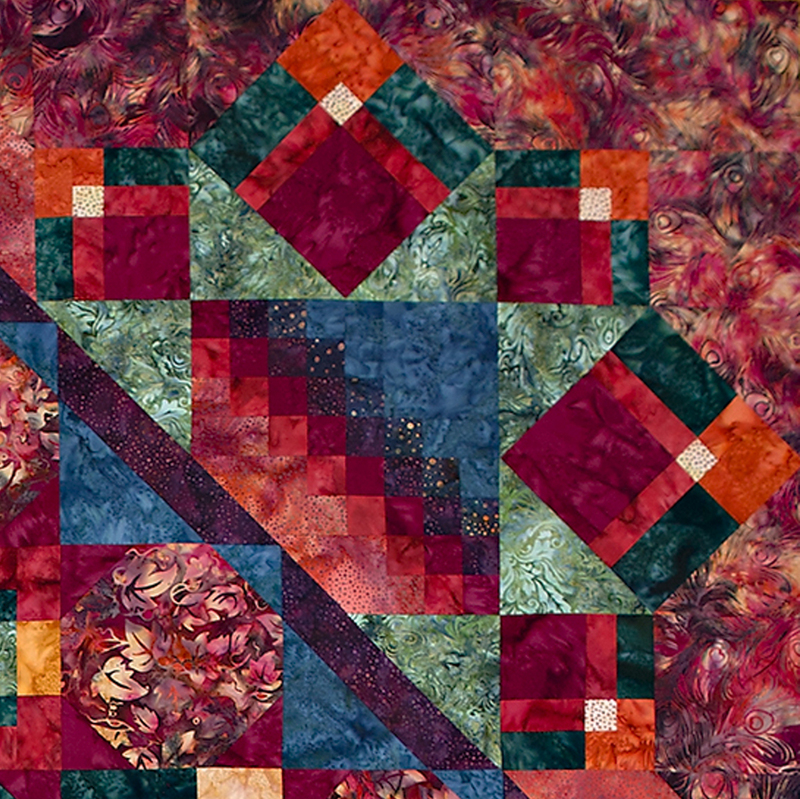 And the pieced border carries that theme all the way to the edges of the quilt. I hope you’ll look at a close up of the quilt above as there is so much to see and so many details you won’t want to miss. When I received the gorgeous fabrics from Hoffman, I was immediately immersed in memories from my years living in New York and Connecticut. There, as the trees changed from their summer to fall colors, leaves were bursting with lush burgundies, rich golds, dark corals and deep plums, set amidst the rich evergreens, all with the intense blue sky backdrop. I knew that is what I would capture with this quilt. I made the center unit stand out as the main focal point, by using the rich wheat tonal as a background. The small, cream dot squares are little sparkling points of light amongst the facets of the center crown of jewels. And you can just see the burgundy triangles encroaching on the dark green border, resembling the prongs holding the precious jewels in a treasured ring. You’ll see by looking at the quilt, that this quilt is a little easier than the last one – Ripples and Reflections. 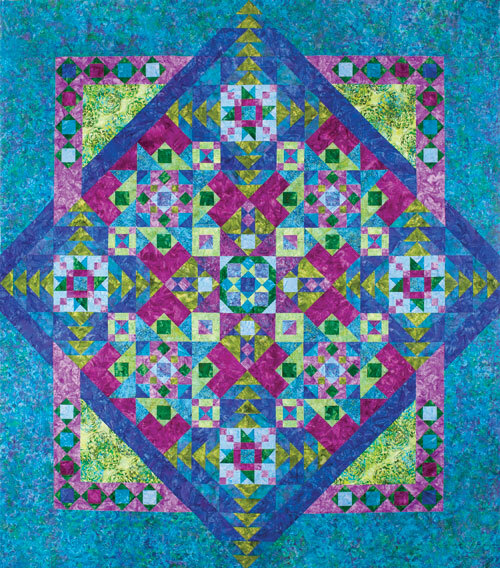 While this is still a quilt for the intermediate quilter, Nature’s Jewels is composed of simple snowball blocks and strip-pieced shadow blocks. There are not as many small pieces and way fewer triangles and bias edges!!! And to make it even easier, this time I will have more in-depth instructions – including finished sizes of all units made (which I left out last time!) – and I’ll put additional monthly tips on this blog. I was so pleased with the reception of Ripples and Reflections, and I’m even more excited about this new project. I think anyone who enjoys watching the seasons change will want to make Nature’s Jewels. Now I just have to get to work on the pattern, which will be available early 2013. 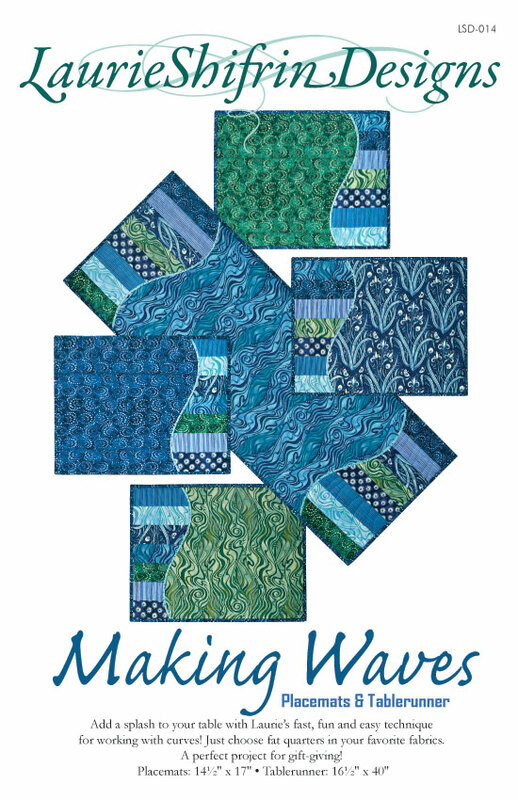 I am a quilt designer, author, quilting teacher and lecturer. 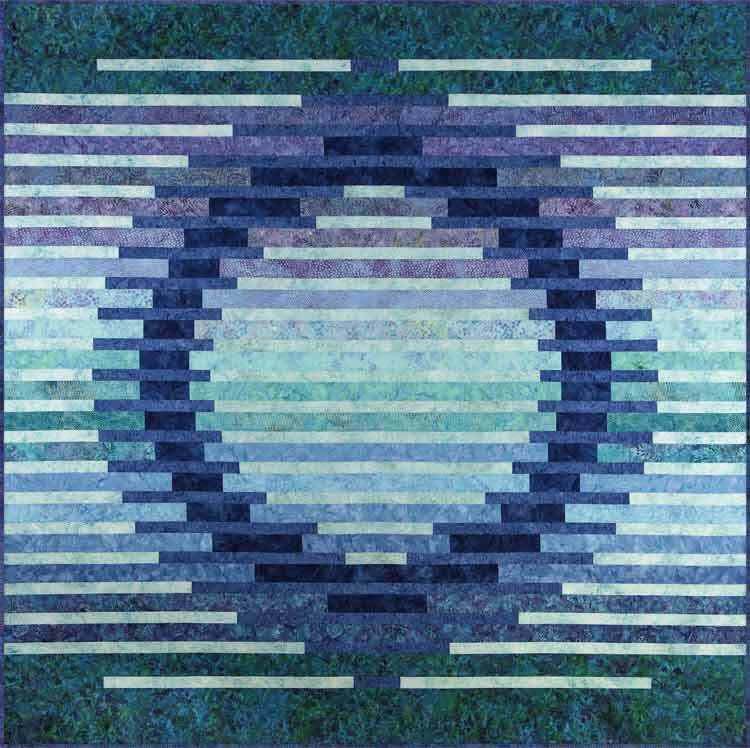 This entry was posted in Laurie's Quilt Designs and tagged batiks, Block of the Month, BOM program, Hoffman Batiks, Jewel quilt, Nature quilt, Nature's Jewels, Quilt Pattern. Bookmark the permalink. Extremely beautiful. I envy your eye for color! Thanks for the nice words. It really wasn’t hard to pick this gorgeous ensemble of fabrics – Hoffman sent me a huge box of wonderful batiks to choose from. 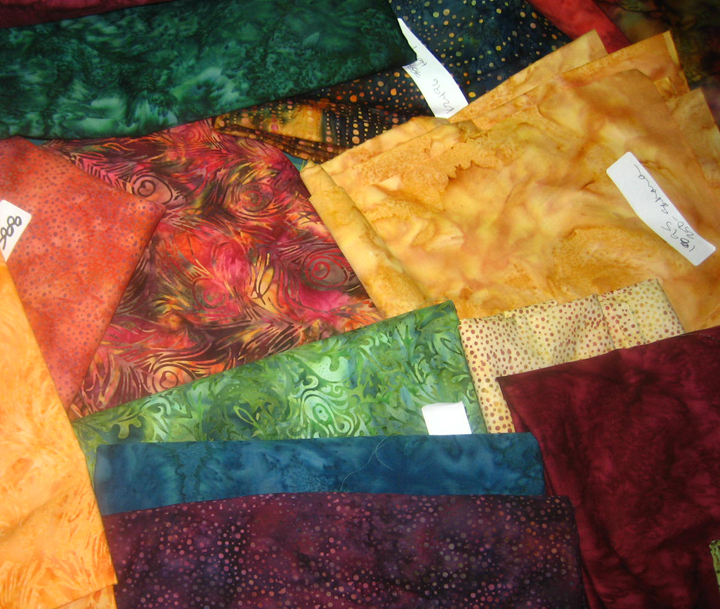 And I had a particular goal in mind for this quilt – I wanted it to look like the richest, most fully saturated Fall colors. Thankfully, the fabrics allowed me to do that! Thanks, Carol. I’m really happy with how it turned out. The pattern should be ready late March (I’m busy working on it now). I’ll post the price when I have it all done. It can be done as a block-of-the-month or just as a straight-through quilt project. More later…. Can you let me know when this pattern is ready? I have been looking for something like this for quite some time to work my way through my stash. Gail, I’m just about done with the pattern and we’ll be printing it in March, so I know they’ll be ready by the end of March. I’m giving extra-detailed directions giving more tips than ever. It really is a fun project and if you make it, I’d love to see what fabrics you choose. Let me know if you want me to contact you when they’re ready. Yes. Can you let me know when it’s good to go! It will be a challenge to adapt to existing fabrics, so I am hoping you have some more generic guidance (as in “light” “medium” “dark” fabric choices. No worries – on the back of the pattern I gave not only the Hoffman code for the fabrics I used, but also my description (medium blue tonal, dark purple dots, etc.) that’ll help you when choosing your own. Each also has a fabric number, which is how they are referred to in the instructions. So you should be all set. and Reflections and it is stunning.Everyone remarks about how bright it is. (Can you really get any sleep under thatthing?) I love it. I am looking forward to working on the Nature’s Jewels pattern.I think it is great that you will be putting down the finished sizes for all the units. Is there a material list available yet? Hi Nancy – congratulations on completing Ripples and Reflections! It sounds like you’re pleased with how it turned out and the satisfaction of knowing you are sleeing under a quilt you worked hard on with great results, should make you sleep soundly! I am hard at work putting the finishing touches on the pattern for Nature’s Jewels. And I’m so excited that I’m getting my quilt back from my quilter tomorrow and get to put the binding on – my favorite way to spend a few evenings. I’ll definitley let everyone know when the patterns are available so stay tuned! Laurie, I just talked to Carrie and I would love to see photos of the quilting on this beautiful quilt. She said it turned out really lovely, between your piecing and her quilting, it will be a winner! Hey Jill!!! So nice to hear from you – I heard you moved away from our wonderful state! I am counting the hours until the UPS package arrives with my quilted quilt tomorrow. Carrie said she didn’t want to return it to me so that’s a good sign. I plan to take photos of her quilting to give ideas to those who will be working on the project down the road. I wish you all the best in your new home and please keep in touch. Beautiful pattern! I wish I had the patience and talent to make this! Thanks for the nice comment. Really all it takes is attention to detail (something I learned in my career as a violinist) and time to work on the project. 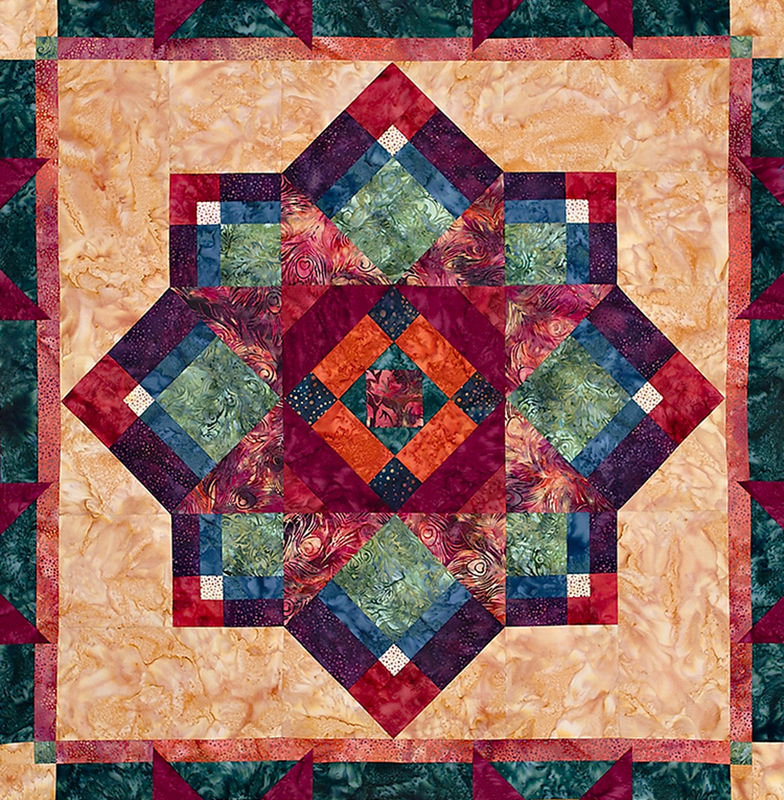 This quilt is doable for any quilter who has good basic skills – there are no tricky techniques. Maybe you have a project like this in your future! Please let me know when this is ready. Will it be a block of the month kit, or will I have to go find the fabrics? 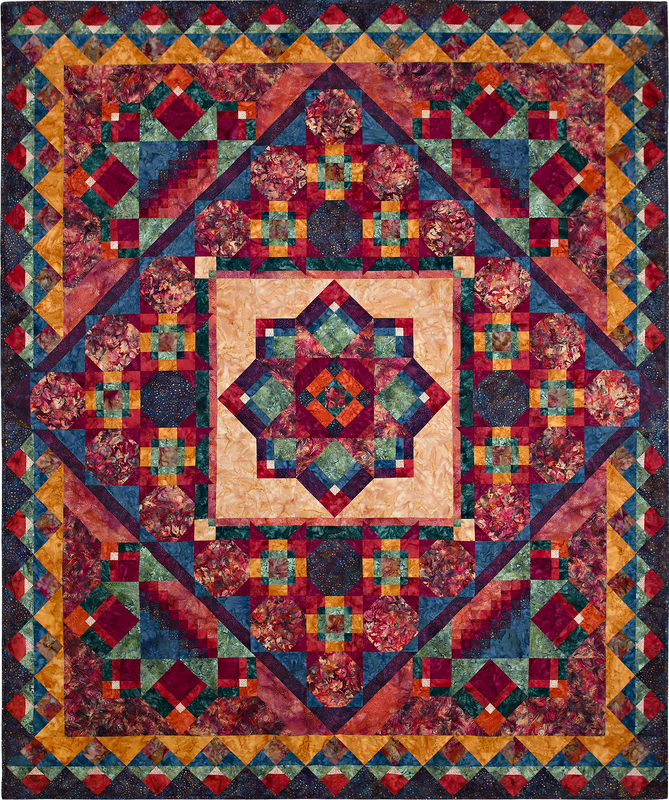 I’ve seen some gorgeous quilts in my day, but this one takes the cake. Absolutely positively STUNNING! Wow – thanks for the amazing comments! I’ve just sent the pattern to the printer and pretty soon the fabrics will be ready – I can’t wait. Nature’s Jewels is offered as a block of the month program, but I know you can also get it as a complete kit. Let me know what area you are in, and I’ll try to hook you up with a shop doing the program. And if your local quilt shop hasn’t signed up for it yet, please let them know how interested you are – it’s not too late for them to order fabrics. Nature’s Jewels is so beautiful. My bed is king size can it be adapted to fit it? Linda, I think it would be easy to turn this into a king-sized quilt. The dark navy with swirl dots in the outer border triangles to me looks like night while the mustard triangles in the outer border feel like day. So I would just add an 8″ border of the “night” fabric to make it 101″ x 116″. You might want to turn it 90 degrees so it is wider than it is tall. Does this sound like a good plan to you?